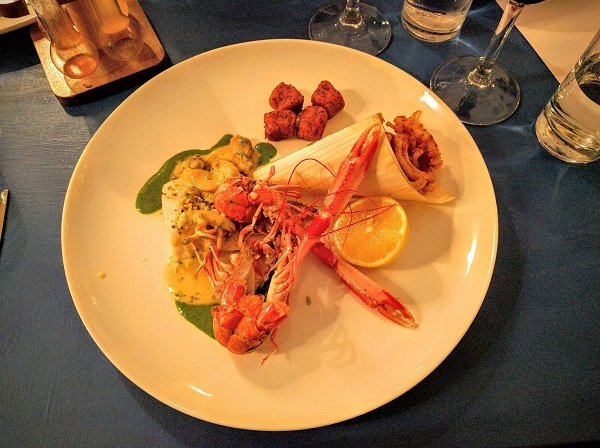 I recently was fortunate enough to be invited to an opening event at The Kilted Lobster, a new restaurant specialising in seasonal Scottish produce in Stockbridge. Not only was the food delicious and interesting, but the owners have a strong sense of social responsibility and have demonstrated this through their “cooking up a storm” project which aims to help the local community by providing training for school leavers, free meals for families facing financial hardship, and cookery classes for people on a budget or with dietary restrictions. To start us off, we were brought some palate cleansing juices in miniature “yard of ale” glasses. They were obviously fresh and a very pleasant way to start the meal, leaving us refreshed and ready for food! 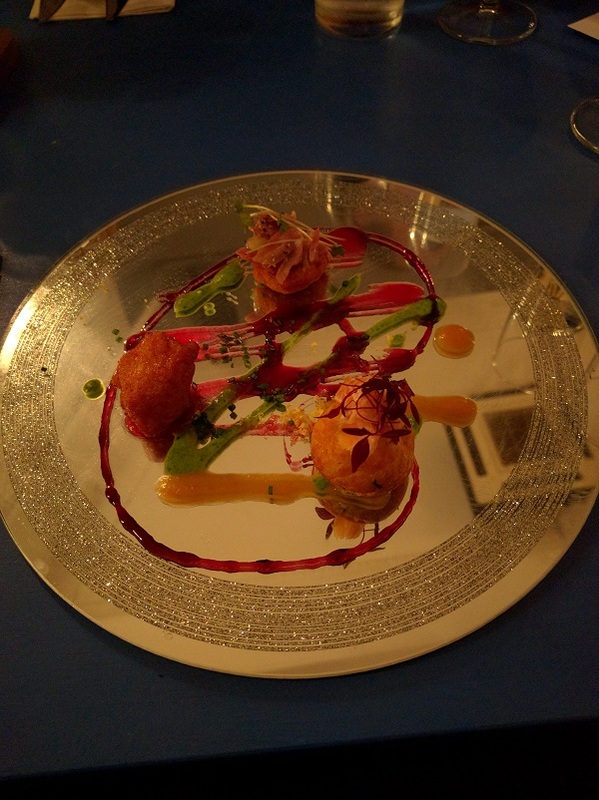 The amuse bouche followed shortly afterwards, comprising a battered scallop, sweet potato gnocchi with ham hock, and a lobster beignet. The highlight for me was the scallop which had been perfectly cooked and encased in a well-seasoned and crisp coating of batter. The gnocchi was well-made and provided a good base for the soft ham hock, and the lobster beignet was rich with soft, sweet lobster. I was immediately excited to eat the rest of chef Colin Hinds’ offerings. 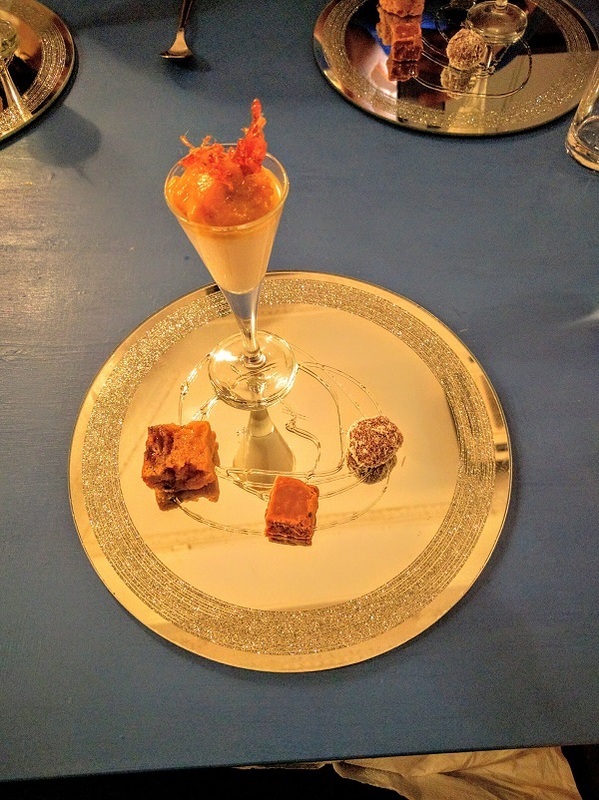 Amuse bouche – consider my mouth suitably entertained! The starter arrived looking very appealing indeed (every dish we had over the course of the evening arrived beautifully presented). 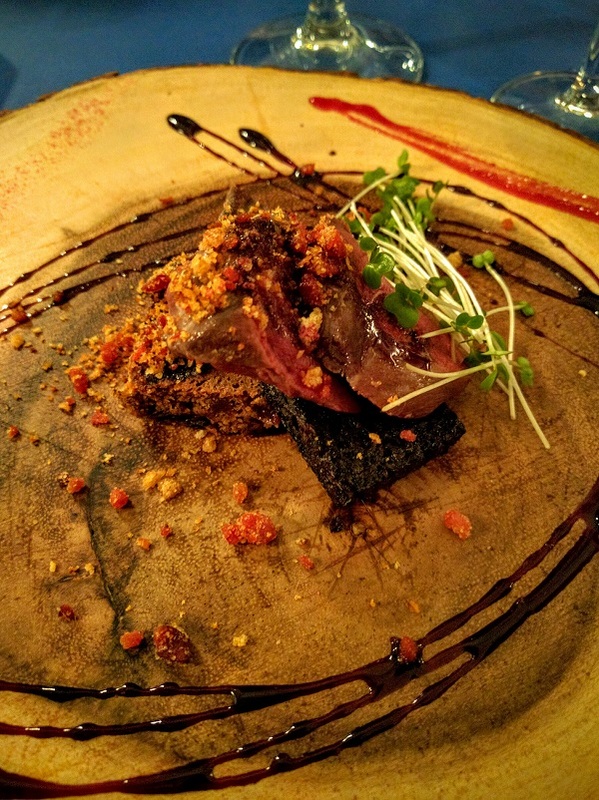 The wood pigeon breast was succulent and pink, its flavour enhanced by the sweet fruit dumpling, earthy black pudding, and hint of piquancy from the chorizo crumble. The merlot syrup was also very interesting, almost like a balsamic glaze in its sticky sweetness but providing a rich, winey hit. Wood pigeon – thoughtfully presented on a piece of wood! I was particularly looking forward to the main course as the restaurant’s name implied a passion for seafood, and I was not disappointed. The calamari was perfect – crunchy batter surrounding soft squid with a slice of lemon on the side to provide zing. The cod fillet was soft and flakey and well complemented by the creamy, slightly salty mussel velouté (this also worked as a nice dipping sauce for the calamari). There were also two juicy langoustines still in their shells but bathed in butter. The sweet potato gnocchi were tasty and light, but paled in comparison to the delights of the fish on the plate. Having thoroughly enjoyed the meal so far, I was almost sad to receive the dessert, knowing it would signal the end of a very enjoyable parade of food. Nevertheless, I was keen to see how the sweet offerings compared after being so impressed by the savoury. I was certainly not disappointed! 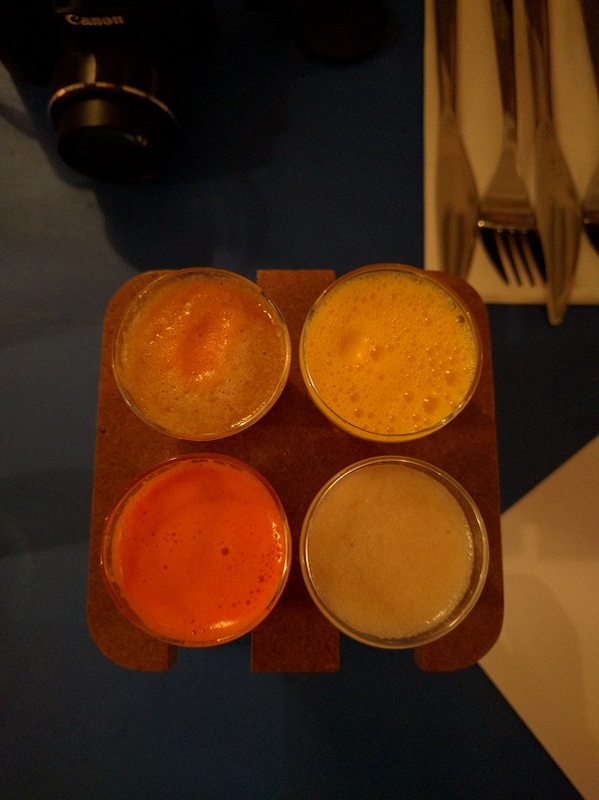 The highlight for me was the toffee apple pannacotta. The pannacotta itself was silky smooth and creamy with a hint of vanilla, while the toffee apple purée and shard of caramel on top of it reminded me of bonfire nights at school eating tart apples coated in caramel and ending up with a thoroughly sticky face! The only issue was that the glasses in which it was presented were too narrow at the bottom to allow my spoon to get every last bit of creamy goodness (I may have resorted to using the handle of the spoon at the direction of another blogger). The clootie dumpling had a great texture as well and was full of whisky flavour from the Jura; the tablet and truffle were both well-made. Overall, I would thoroughly recommend The Kilted Lobster as a place to go for a nice dinner with friends and family or an intimate setting for a date. The staff were friendly and professional, and Colin Hinds is clearly knowledgeable and passionate about seasonal Scottish ingredients, which he handles with a deft and respectful touch. The fact that the restaurant is also heavily invested in the local community and has such a strong sense of social conscience makes one feel even better about going and sampling the delicious food. Find out more about The Kilted Lobster on their website.